The WHERE statement is an alternative to IF statement when it comes to subsetting a data set. WHERE (condition is true) => It means subsetting a dataset. Task1 : Suppose you want to select only section A students. 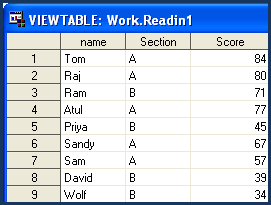 You know the variable Section contains information for students' sections. where section EQ "A" => This would tell SAS to select only section A values. You can also write where section = "A". This statement serves the same purpose. Task2 : Suppose you want to select section A and B students. 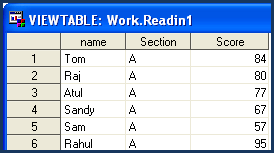 You know the variable Section contains information for students' sections. where section IN ("A" "B") => This would tell SAS to select section A and B values. Task 3 : Suppose you want to select scores whose values are greater than or equal to 50 and less than or equal to 75.
where Score between 50 and 75 => This would tell SAS to select values through 50 and 75 (not 51 to 74). Task 4 : Suppose you want to select only those observations in which students did not fill their section information. The dataset is modified to include missing values in SECTION variable. Where section is missing => This would tell SAS to select missing values for variable SECTION. 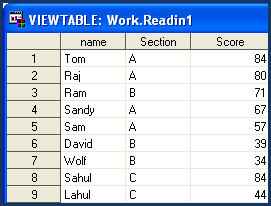 Task 5 : Suppose you want to select only those observations in which students filled their section information. Where section is not missing => This would tell SAS to select non-missing values. Task 6 : Suppose you want to select only those observations in which students' name contain 'hul'. where name contains 'hul' => This would tell SAS to select observations having the values Rahul, Sahul and Lahul for the variable NAME. Note : The CONTAINS operator is case sensitive. The LIKE operator selects observations by comparing the values of a character variable to a specified pattern. It is case sensitive. Task7 : To select all students with a name that starts with the letter S.
This would not select PAHULK from the variable NAME. This would select PAHULK as double underscore (__) is stated. Task8 : To select names that sound like 'Ram'. 1. In the example shown below, the WHERE= data set option is used to select only section A data. Difference between WHERE and IF conditions - WHERE Vs. IF . 6 Responses to "SAS : Where Statement and Dataset Options"
Hello ! What is the difference between below 2 snippets of code? I think code2 is more efficient while dealing with large datasets as it subsets the dataset at reading stage only. Hey in one of your examples of where name = "_ahu__" would Rahul be selected because after l there is no other character available.